It's hard being British during awards season. Seeing British films nominated is great; seeing people win just for playing monarchs is frankly quite depressing. But unlike The Queen or Shakespeare in Love, the acclaim for The King's Speech has a lot more to it than simply baiting the Oscars. Stripped of all its ploys and generic concessions, it remains an enjoyable, well-made film that will outlive most of its competitors. There was a time, not so long ago, when British period dramas about royalty (and by extension the aristocracy) were very tight-lipped affairs. Merchant Ivory and their derivatives handled their stories with an emphasis on repression, creating scenes where humour was seldom tolerated and private anguish emphasised almost to the point of tedium. 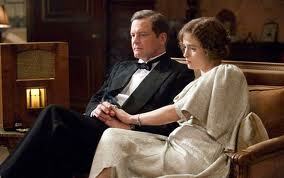 What makes The King's Speech such a breath of fresh air is the complete absence of this suffocating stiff-upper-lip. The film does more than its fair share of exploring British pleasantries and social graces, but it never takes itself too seriously in doing so. David Seidler's script is closer to the work of Alan Bennett in The Madness of King George, or to some extent Julian Fellowes in Gosford Park. There is a sense of playful mischief at the heart of it which prevents the film from becoming self-important. To this end, the moments of humour in The King's Speech are a balance between subtle one-liners for the costume crowd and more raucous elements that will pull in a mainstream audience. One cannot help but titter during George's arguments with Edward, involving the latter's attempts at "kinging" and letting Wallis Simpson sleep in their mother's suite (to which Edward remarks: "Mother's not still in the bed, is she?"). But the really laugh-out-loud moments come when George is made to swear therapeutically, delivering Anglo-Saxon vulgarisms with both reserve and abandon. The King's Speech is at heart a character piece, carried not by its storyline but by the talent and charm of its performers. And you couldn't have picked a better cast. 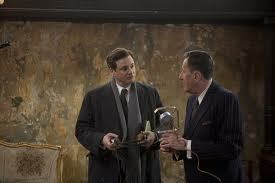 Colin Firth is great in the lead role, delivering a performance almost on a par with his work in A Single Man. He shrinks into the role, slurring his 'r's and staggering his gait in a deeply empathetic manner, taking us right inside the strife of a man beset not just by a speech impediment but years of insecurity brought on by his brother and his father. Not only is he a reluctant king, he is naturally withdrawing, using even the most dated traditions for much-needed support. 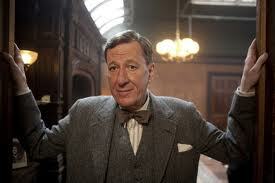 Geoffrey Rush is brilliant as Lionel Logue, nailing the character so early that he can be serious and well-meaning one moment and camp it up as Caliban the next. Helena Bonham Carter makes a successful return to her costume drama roots, carrying herself with just the right mixture of grace, pomposity and cheek. Elsewhere there are good supporting turns from Michael Gambon and Derek Jacobi, himself no stranger to stammers through his work on I, Claudius. 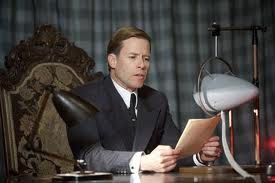 But most surprising of all is Guy Pearce, who brings a real complexity to Edward VIII. The film makes no bones about his Nazi sympathies and skewed devotion to Wallis, but we really feel a lump in our throats when he is forced to decide between her and the throne. 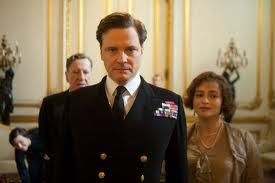 But although the performances dominate our memory of the film, The King's Speech is a great deal more than a gallery of famous British actors talking in rooms for two hours. All accusations about the film being televisual are complete and utter balderdash. 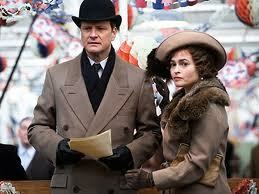 Tom Hooper is a director who excels at putting personal conflict up on screen, even behind closed doors. Through meticulous sound design and an excellent choice of camera angles, he manages to make the drama both personal and expansive. 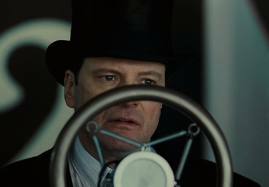 We hear every hesitation in Firth's throat, and when he can get the words out the world he is addressing stretches far beyond the four corners of the screen. The film's ambiguous title hints at the three main issues tackled by the film beyond its conformance to generic conventions. Firstly, there is 'The King's Speech' as in 'King's English', the form of standard English against which all dialects are compared, contrasted, weighed in the balance and found wanting. Although it doesn't touch on it in great detail, The King's Speech raises an interesting issue about how social hierarchy is ingrained even in language. The King is the head of both the imperial and the lingual family, and the hierarchy of accents below him is every bit as old-fashioned and restrictive as the insistence upon people's breeding. If the King cannot speak, then this entire system of hierarchy based on comparison threatens to collapse, putting the whole empire in jeopardy. 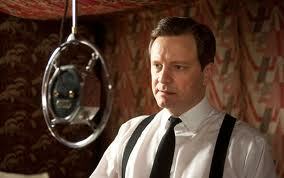 Secondly, 'The King's Speech' refers to the actual stutter or stammer and the various stigmas attached to it. Aside from the stammer, George VI suffered from a number of other problems, some congenital (knock knees), others nurtured (being forced to write with his right hand, despite being naturally left-handed). 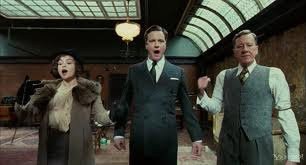 In his big scene, Michael Gambon (playing George V) shouts at Firth every time he stammers, demanding that he get it out of his system. This was an age where stammering was seen as something which could be cured by parental discipline rather than caused by it, and in which fear was the natural basis of a father-son relationship. Thirdly, the title of The King's Speech refers to a momentous event, whether the state opening of Parliament, the Christmas address or in this case the declaration of war. 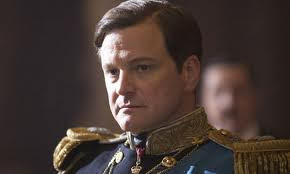 After recording his Christmas address, Gambon complains that the invention of the wireless has reduced the monarchy to little more than actors, and later on Firth is wrestling with his exact role as King. Since he has no constitutional powers, he can only be an emblem - he speaks for the nation not as a legal representative, but as someone whose persona and moral values reflect the nation as a whole. His role as King is not just to hold ministers to account, but to feel his way through the ether for some common ground or position of national empathy. There are a couple of faults with The King's Speech. Being a film about the triumph of the human spirit, and based on a true story, it is massively predictable. This doesn't stop us rooting for the characters, but with all the interesting ideas running alongside we can't help wishing for something more adventurous as the story winds to a close. Even if we accept the various dramatic devices which Hooper puts in place, we still have to suspend disbelief quite some way to believe that the relationship between George and Logue was as informal as depicted. And there are small inconsistencies surrounding the passage of time: as in A Beautiful Mind, many years pass but the girls don't get any older. In the end, however, it is very easy to overlook such problems, because The King's Speech is a damn fine film. Taken purely as an actors' piece it is a delight, with a gallery of fine performances anchored by Firth who fully deserves his Oscar. Hooper's direction is intelligent and restrained, and the film never feels manipulative or melodramatic in the way that crippled Shine. While not a perfect film, it is a very fine piece of work which everyone should readily embrace. I loved this film. I just read The Golden Prince (http://www.amazon.co.uk/Golden-Prince-Rebecca-Dean/dp/0007315724/ref=sr_1_1?ie=UTF8&qid=1290527328&sr=8-1) which deals with Edward's life, so it was nice to see more about this era of the Royal family.